One ep down and we srsly can't wait for more! 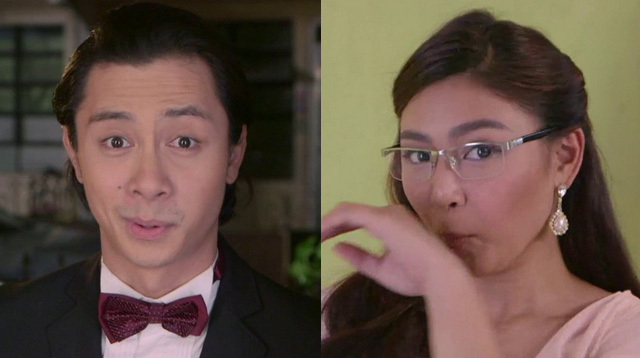 Last night, die-hard JaDine fans tweeted their support for the pilot episode of James Reid and Nadine Lustre’s new soap Till I Met You. And yes, in usual JaDine fashion, the hashtag #TIMYLoveBegins quickly shot up on our trending feed. Much to our surprise (and, we suppose, yours as well), the pilot ep centered on the friendship between Iris (Nadine) and Ali (JC Santos)–leaving us confused AF with their natural chemistry. Any Iris-Ali shippers out there? We know you guys exist. When you hear the beating of your heart..
And everyone ceased to exist for you. Of course, with James’ quick reveal at the end of the episode, Basti-Ali shippers cheered on! James was all praises for his girl Nadine and new bro JC! And so was everybody else!